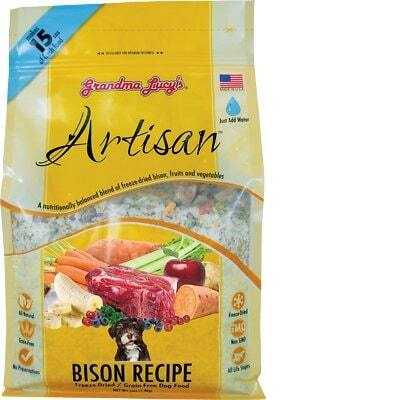 Grandma Lucy's Artisan Grain-Free Bison is a high-priced freeze-dried dog food with exceptional quality. This product has zero controversial ingredients, which also means no artificial colors, flavors or preservatives are used. The food has a slightly higher amount of carbs, compared to its protein and fat content, but excellent meat and fat quality. Grandma Lucy's has no recalls and the company was very transparent when answering our questions. For all these reasons, Watchdog Labs highly recommends this product. This food has a good amount of protein but is somewhat high in carbs, which is lowering the fat content slightly and making it less nutritionally balanced compared to other dog foods we evaluated. Carbohydrates are cheap so they keep the food’s cost low. They are nutritionally useful to dogs in the right amounts, however, high amounts of carbs can reduce the much-needed meat-based protein and fat content. This product has a relatively high amount of calories. It’s important to understand how many calories you are feeding to prevent under or overfeeding. If your dog has fair to low activity levels, you may want to feed less than the labels recommend amount, since high-calorie foods like this are often feed to more active dogs who require a higher amount of daily calories. It's helpful to know that weight loss foods often have fewer than 340 calories per cup, weight maintenance foods typically range from 340-380 calories, and high-activity dog foods are usually over 400 calories. USDA Bison, Potatoes, Flax, Sweet Potatoes, Carrots, Celery, Apples, Bananas, Blueberries, Cranberries, Pumpkin, Garlic, Vitamin A, Vitamin D3, Vitamin E, Niacin, Iron, Calcium, Phosphorus, Zinc, Riboflavin, Thiamin, Potassium, Manganese, Chloride, Copper, Magnesium, Pyridoxine, Cyanocobalamin. The average dog food we reviewed has 39 total ingredients, with 1 controversial ingredient. This product does not have any controversial ingredients, which is great to see. Bison is high-quality meat that provides protein, calcium, iron and other nutrients to dogs. Raw meat contains about 75% water which is cooked off during the making of dog food. This leaves only a fraction of the protein content in the final product's weight. We recommend looking for dog foods that also include meat meals in the first five ingredients (pre-cooked meat powder that contains four times the amount of protein). Bison is generally a healthy dog food ingredient. Potatoes provide carbohydrates (mostly starch) and are a rich source of vitamin B6 and vitamin C. The U.S. Food and Drug Administration (FDA) has warned that there is a potential link between potatoes and canine heart disease. It is still too early to draw conclusions so we cannot yet say if potatoes are a generally high-quality dog food ingredient or should be avoided. Flax (also known as linseed), is a plant that contains high levels of protein, dietary fiber, B vitamins, and dietary minerals. Flax is also very rich in thiamine, magnesium, potassium, and phosphorus. It's unique in that it is one of the best plant-based sources of Omega-3 fatty acids. We consider it a high-quality dog food ingredient. Sweet potatoes are a root vegetable that are rich in complex carbohydrates, dietary fiber, beta-carotene and other vitamins. They are a high-quality dog food ingredient. Carrots are a root vegetable and contains healthy nutrients like carbohydrates, fiber and beta-carotene. We consider it a high-quality dog food ingredient. Grandma Lucy has not included any controversial ingredients in this food. Grandma Lucy’s is clearly labeling the meat source as “USDA Bison” in this product. This is great because it shows you the specific source the ingredient comes from. They are just as clear with the fat source flax. Having meat and fat sources clearly named is a great sign of quality. This Grandma Lucy’s product does not contain any controversial preservatives. It’s good to know that ‍not all artificial preservatives are bad. That’s because they serve an important purpose, which is to prevent food from spoiling. However, we consider 11 artificial preservatives controversial because of their potential link to cancer and other serious health conditions. No artificial colors are in this product. No artificial flavors are in this product. Grandma Lucy’s has a below-average number of recalls. Grandma Lucy’s did not respond to the first or second email that were sent. Eventually we did get them on the phone at which point they fully and completely answered all the questions. Since the call was not recorded, the following responses are paraphrased - they should not be seen as exact statements from the company. Dr. Dodds is involved in the formulation process. Formulate instead of doing the trials. Instead they perform their own trials. It’s a safety-focused environment that cannot have tours.